Psst… want to know the secret for being a great mom? Think she keeps house like June Cleaver, cooks like a Food Network star, and actually does all of the things she pins to her Pinterest boards? Oh…and all while calmly raising her kids without ever raising her voice? Yeah….right. 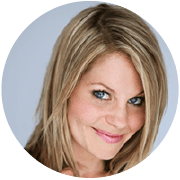 “The way I mother is the right (and only) way,” “Motherhood is natural, easy, and instinctive,” or “My child’s bad choice means I’m a bad mom.” These myths leave moms hoodwinked and sometimes even heartbroken. Ultimately, Hoodwinked equips mothers to stop searching for the secret and develop and embrace their relationships instead- with their kids, other mothers, and most importantly, with God. Karen Ehman is a New York Times bestselling author with Proverbs 31 Ministries as well as a writer for Encouragement For Today, their online devotions that reach over one million women daily. She has authored eight books including the popular LET. IT. GO: How to Stop Running the Show & Start Walking in Faith and her new release KEEP IT SHUT: What to Say, How to Say It and When to Say Nothing at All, both which include a companion DVD Bible study series. 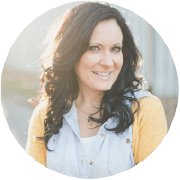 Karen has been a guest on national media outlets including The 700 Club, At Home Live, FamilyLife, Engaging Women, The Harvest Show, Moody Midday Connection, and Focus on the Family. She has been married for over a quarter-century to her college sweetheart Todd and together they raise their three sometimes quarrelsome but mostly charming children in the boondocks of central Michigan. There she enjoys antique hunting, farm market strolling, and processing life with family, friends, and the many teens that gather around her kitchen island for a taste of Mama Karen’s cooking. Ruth Schwenk is the creator of TheBetterMom.com, and along with her husband, the creator of FortheFamily.org. She is a pastor’s wife, mom of four energetic kids, a lover of coffee, and dreamer of big dreams. She loves leading, speaking, and blogging. Ruth is the co-author of two forthcoming books with Zondervan. A graduate of The Moody Bible Institute, Ruth and her husband have been serving in local church ministry for nearly fifteen years. Which of us moms, before we had kids, didn’t swear that we’d get it right, only to find out somewhere along the way that motherhood isn’t always everything it’s cracked up to be? Equal parts encouraging and inspiring, Hoodwinked is the perfect dose of relief for any mom feeling guilty for not being able to do it all. Hoodwinked reads like an encouraging letter from a friend. It is full of grace, biblical wisdom, and inspiration. Many books on motherhood leave me wondering if I’m doing it all wrong. Karen and Ruth are bravely transparent and meet us moms right where we are. This book gives us the hope and encouragement we need in the midst of weary days. Karen and Ruth understand what it is to battle the voices of guilt, anxiety, and inadequacy that plague many mothers who want to give their best to their children. In this book they share life changing truths that all mothers can grab hold of, not just to survive the journey of motherhood but to thrive in confidence and joy. Motherhood is not a trick or trap—it’s a calling. In our culture, moms are constantly sent mixed messages. This powerful book will help mothers walk in the truth of the gospel! 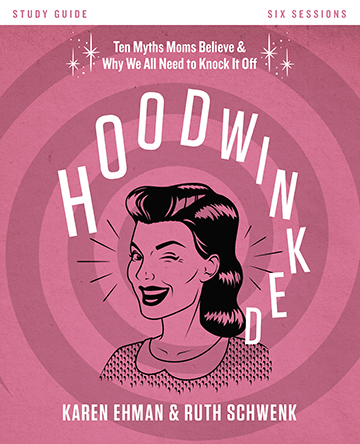 Hoodwinked is a clever, insightful, and much-needed resource for moms of every age! Debunking the common myths about motherhood touched the deep insecurities I have wrestled with as a new mom. It is a beautiful book all moms should read. 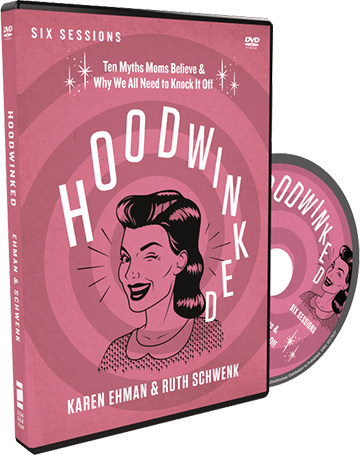 If you’ve ever wondered if you are doing this mom thing right, pick up Hoodwinked for wise guidance, laughs, and assurance. You’ll learn how to tell the difference between what’s important—and what’s not—in this loving guide from two moms who have been there. Moms of all seasons will find compassion for the demands of the journey as well as hope and inspiration for living faithfully as a mother. Heartwarming stories, soul-filled inspiration, and generous wisdom fill each page so that mothers will feel understood, validated, and uplifted. I love the ministry hearts of Ruth and Karen and know their stories will encourage every mom who reads this book. Hoodwinked is an excellent source of encouragement for moms. It dispels the myths that confuse us and the lies that bring us down. I can’t even begin to tell you the many times I felt like a failure or how often I compared myself to other moms. If only this book had been around twenty years ago when I started raising children, I would have done things differently. Hoodwinked is for every mother who has ever questioned her parenting ability. Ruth and Karen, a dynamic duo, have teamed up to equip women to silence the destructive motherhood myths with the freeing truth of God’s Word! Oh, how I wish I’d had this book when I first became a mom! Karen and Ruth have pulled back the curtain on the lies we tend to believe about motherhood. Even more importantly, though, they have revealed the truth that will set us free. Soak in these words, recalibrate your thinking, and be hoodwinked no more! Today’s wives and mothers have been hoodwinked; convinced that serving their family is a subservient and antiquated role. Because of culture, family, friends, or lack of biblical teaching, many moms miss how valuable and powerful their calling really is. Some have bought into the pressure to be “Supermom.” Others have believed the myth that they can “do it all” and do it perfectly. This six-session video-based study will encourage and inspire women to embrace their roles as mothers wholeheartedly yet realistically, whether they work outside the home, have a home business, or are stay-at-home moms. Mothers will find a fresh new vision for an age-old calling as they tackle the challenges and embrace the blessings of motherhood.